There are 2 groups known as Fourplay, 1) An American smooth jazz group, 2) An Australian string quartet: 1. Fourplay is a jazz group, founded around 1990, in the USA. Current members are: Bob James (keyboards & programming), Nathan East (bass & vocal), Chuck Loeb (guitar) & Harvey Mason (drums & percussion). Loeb replaced Larry Carlton who himself had replaced the founding guitarist, Lee Ritenour in '98. 1. Fourplay is a jazz group, founded around 1990, in the USA. Current members are: Bob James (keyboards & programming), Nathan East (bass & vocal), Chuck Loeb (guitar) & Harvey Mason (drums & percussion). Loeb replaced Larry Carlton who himself had replaced the founding guitarist, Lee Ritenour in '98. Fourplay is a contemporary jazz group in the United States. The original members of the group were Bob James (keyboards), Lee Ritenour (guitars), Nathan East (bass), and Harvey Mason (drums). In 1998, Lee Ritenour left the group and Fourplay chose Larry Carlton as his replacement. 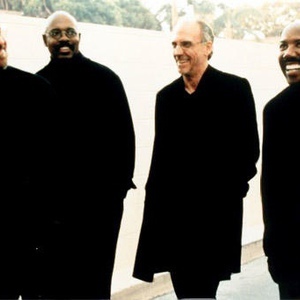 Grammy nominated supergroup Fourplay has enjoyed consistent artistic and commercial success by grafting elements of R&B and pop to their unwavering jazz foundations. In a span of seventeen years and ten albums, the quartet has continued to explore the limitless dimensions and permutations of jazz while at the same time appealing to a broad mainstream audience. Their first record, 1991's Fourplay, sold over a million copies and remained at the number one position on Billboard's contemporary jazz charts for 33 weeks. Their next LP, 1993's Between the Sheets, reached number one, went gold, and received a Grammy nomination. In 1995, their third gold album, Elixir, also reached the number one position and remained on the charts for more than 90 weeks. ?Fourplay has been a formidable and high-profile entity in contemporary jazz for almost two decades, with a track record of musical innovation that speaks for itself,? says Dave Love, President of Heads Up International. ?Each artist in the band's lineup is an immense talent in his own right, but the synergy of all four players adds up to an even greater whole. We're very excited to have them on the Heads Up roster, and we're very much looking forward to a great record this year (2008). 2. FourPlay are an Australian string quartet often known as FourPlay String Quartet to avoid confusion with the jazz group. Members are brothers Peter and Tim Hollo, Lara Goodridge and Veren Grigorov.